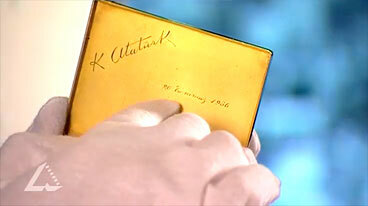 Video clip synopsis – Stanley Melbourne Bruce treasured Turkish President Mustafa Kemal Atatürk’s gift of a gold cigarette case throughout his life. Broadband MP4 bruce_bb.mp4 (17.5MB), suitable for iPods and computer downloads. Stanley Melbourne Bruce’s Cigarette Case is an episode from the series The Prime Ministers’ National Treasures, produced in 2007. 5.8 locates, selects and organises relevant historical information from a number of sources, including ICT, to undertake historical inquiry. Stanley Melbourne Bruce was born into a wealthy commercial family, and was an outstanding athlete at school and later Cambridge University, where he qualified as a barrister. He was in England when war was declared in 1914, and enlisted in the British Army. He was awarded the Military Cross, a high order award for bravery in battle, at Gallipoli. He was wounded and returned to Australia in 1917. He entered the Commonwealth Parliament in 1918, and served as Treasurer, and then Prime Minister. He served as Australia’s High Commissioner to Britain between 1933 and 1945. Until the day he died, Stanley Melbourne Bruce kept two photographs in his study – one of his wife and one of Turkish President Mustafa Kemal Atatürk, the founder of the modern Turkish state. As young men they were enemies at Gallipoli, but during the post-war years of international reconstruction, they forged a mutual admiration as passionate advocates of secularism. After the League of Nations Montreux conference in 1936, that successfully organised the international passage or warships through the Dardanelles and Bosporus Straits of Turkey, Atatürk presented Bruce with a gold cigarette case, which he treasured for the rest of his life. Stanley Melbourne Bruce (1883 – 1967) was Prime Minister of Australia from February 1923 to October 1929. Stanley Melbourne Bruce’s cigarette case is held at the National Archives of Australia in Canberra. 2. What happened to the returned soldiers? We focus on what happened to the soldiers and nurses during the war — but what about after the war? The National Treasure tells us that Bruce was employed and performed public service after his return from the war. How typical was he? People had to come back to find jobs, and houses. What happened when the men returned to find their job taken by a man who chose not to go to war? Many were physically damaged and needed medical care. Many were psychologically damaged and needed care — but was that understood and given at the time? And what happened to the families of the men who came back — how did they respond when their father/husband/son returned, perhaps a very different person to the one who left. And the nurses — what happened to their hopes for a normal family life? How did the society respond to the building of memorials — were the memorials seen as honouring the men who fought, or were they seen as a perpetual accusation against the men who chose not to go? Research these experiences and report on it in class. See STUDIES magazine (Ryebuck Media) 1/2006 ‘What happened to Australia’s returned soldiers in the 1920s?